Toyger cat breed information and advice. Ever wanted a miniature tiger in your home who will shower you with love and affection? You’d better take home a Toyger! The Toyger breed is the whole package, with both handsome good looks and an affectionate personality. While they bear more than a slight resemblance to their distant ancestor, the Bengal, these cats are not as ‘in your face’ their cousins, and breeders owners alike sing the praises of their gentle natures. The Toyger is a highly intelligent, active breed but also very much a lap cat, who wants nothing more than a cuddle — refusing to do so often ends up with him shouting at you until you give in! Unlike their Bengal cousins, can be very feisty and love attention, Toygers tend to cause mischief on the sly. Gill says they are always getting her other cats, especially her kittens, into trouble before walking away. She adds: “They’re adorable and so gentle and sweet; they’re very good with children and other pets. I’ve homed kittens to families with big dogs, and within hours they’re lying next to each other. Toygers have a very calming effect. Toygers love to play games with their owners and will happily play fetch for hours on end. They especially love to practise their pouncing skills on feathers. Toygers are instantly recognisable by their beautiful coat patterns. Their coats are dense and luxuriously soft, with a modified mackerel tabby pattern with branching and interweaving stripes. Brown mackerel tabby is currently the only recognised colour, giving these cats a black and gold striped look, much like a miniature tiger. The Toyger has a sleek, muscular body with a long, thick tail, which is carried low as well as small, rounded ears, and small to medium eyes, which are normally yellow or green. The Toyger was developed in the USA by Judy Sugden, whose mother, Jean S. Mill, is the founder of the Bengal breed. In the late 1980s, Judy was working to improve the clarity of the markings in mackerel tabbies descended from Bengals and domestic shorthairs. She noticed that her cat had two spots of tabby markings on the temple, and realised this could be the key to developing a cat with the true circular pattern, similar to that on a tiger’s head. A striped domestic shorthair, Scrapmetal, and a big-boned Bengal, Millwood Rumpled Spotskin, formed the cornerstone for the young Toyger breed. Judy also imported Jammu Blu, a street cat from India who had spots between his ears, rather than the regular tabby lines. The other important make-up of the Toyger was to get the laid-back personalities of domestic cats. In 1993, Judy’s hard work paid off, and The International Cat Association accepted the Toyger for registration. It wasn’t until June 2016, though, that the breed gained preliminary status with the GCCF. The Toyger is generally a healthy cat and is no more predisposed to infectious diseases than any other breed. Some breeders claim that some cats show an adverse reaction to the feline leukaemia vaccine, but this has not been substantiated. Responsible breeders screen their cats against diseases to which Bengals can be prone, such as hypertrophic cardiomyopathy (HCM), pyruvate kinase deficiency (PKDef), and progressive retinal atrophy (PRA). However, anecdotal reports indicate that the incidence of all these conditions is significantly lower than in the Bengal, due to the Toyger’s outcross to domestic shorthairs. As they have dense, short hair, Toygers’ coats are very low maintenance, and only need to be brushed once a week. Healthy kittens should be playful and inquisitive, and come to investigate when you visit. Look for kittens with bright, clear eyes, and clean ears and bottoms. Make sure their mother, and possibly father, is present. Is the Toyger the cat breed for you? As they are less demanding than their Bengal ancestors, Gill says Toygers will suit most households, and are even happy to be homed with full-time workers — as long as you’re willing to put in plenty of time to play with them once you get home. Toygers are active cats but will live happily as indoor cats, given adequate space and mental stimulation. 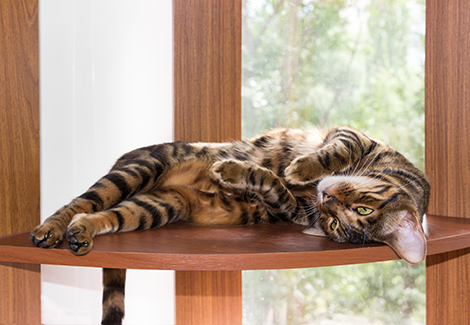 They enjoy going outdoors too, but secure outdoor housing or garden enclosure systems are recommended to keep your Toyger safe. They get on well with children, other cats, and cat-friendly dogs, making them ideal family pets. However, they do like company, so may not be happy as single cats, if left alone for long periods.